"One of my favorites [of True/False 2015]... a fascinating study in unintended consequences." 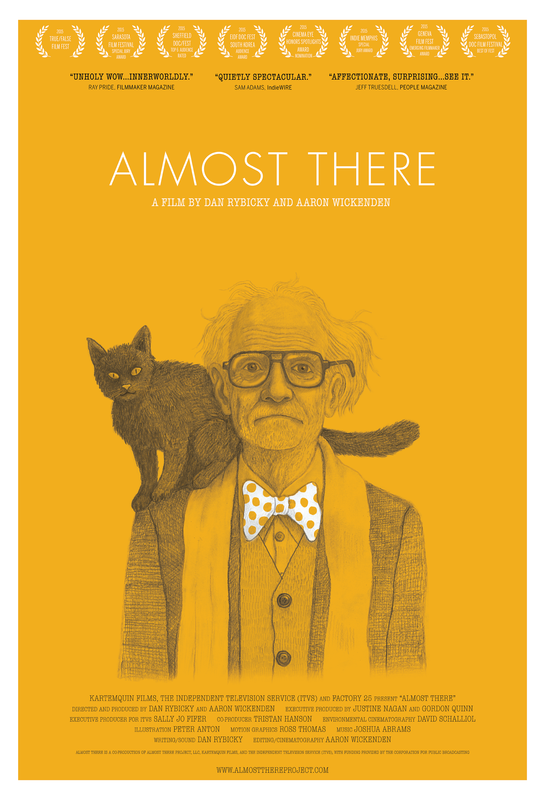 "Almost There is a film about what it means to grow old in America, how this process can be complicated by mental illness, and how the whole bizarre panoply of life can be redeemed by art." "At no point did I have a good idea of what would come next. This film keeps changing its course, and we follow eagerly with all of our curiosity intact. Rybicky and Wickenden manage to break our hearts without becoming remotely sentimental. Prepare to weep, and perhaps fix that pesky mold growing in your kitchen. It’s simply a gem of a film." "A case study for filmmakers and students who enjoy wrestling with documentary ethics... a powerful and honest film about art, family, aging and, heck, being human... Almost There is one of the best documentaries of the year." — Tom Roston, POV Blog. "[i]t is beautiful to watch the initial encounter, perhaps necessarily, spiral into all-too-human friendships, reflexivities, betrayals--and also, among poignant acts of forgiveness, an undeniable provocation to more deeply consider the nature of documentary practice itself." "An intriguing, narratively unpredictable work embracing a hornet's nest of ethical issues." "Almost There displays the vulnerability of both filmmaker and subject in such a way that process and product are woven together. As directors Rybicky and Wickendon unravel Peter Anton’s past, they allow themselves to become vulnerable to the audience as well, thus painting a complex portrait of the relationship between filmmaker and subject, art and life, and the joy of coming up from being down." "Emotionally charged... homes in on the ideas of community, about caregiving and giving care, about human nature and humanity, about parenting and becoming parents to the people we once called mom and dad. It is about surviving and survival — or to quote lyrics from another old standard, it’s about dusting yourself off and starting all over again. Because, as we learn from the song — and Peter Anton — nothing is impossible." "The film closely navigates Anton’s world with a buoyant and organic hand...The filmmakers use him as a lens to view humanity." "Full of surprises...One of the most interestingly constructed docs of the year." "Almost There is a Midwestern Grey Gardens...Rybicky & Wickenden blend the sublimely weird with the rot of decades. It is art, seasoned for better or worse, with humanity." "A thoroughly self-examining, and open-ended rumination on filmmaker-subject complicity, responsibility, and purpose... It’s rare for a film to be both sincerely outwardly and inwardly focused, and pretty much unheard of for one to explore, as Almost There does, how they can be effectively the same thing." — Eric Hynes, Reverse Shot. "Beautiful... the heart of Almost There lies in the unmistakable persistence of compassion, seen not only in the directors, but also in the people who choose to help a man who struggles mightily to help himself." — Seth Boster, Vox Magazine. — David Wilson, True/False Festival co-creator. "Our favorite film at True/False: accidental, affectionate, surprising, affirming. See it." — Jeff Truesdell, People Magazine. "Almost There is a quietly spectacular exploration of artistic and personal responsibility, aging, outsider art and cats." "Blown away... A journey of art, heart & surprise." — Jesse Moss, director of The Overnighters. "“Almost There” blends personal portrait with an exploration of the responsibilities of the director in fascinating, exhilarating ways... heartfelt, funny... honest, absorbing footage... emotionally resonant." "So powerful and beautiful. Like Death of a Salesman, it's about the average man... but the guy has incredible heart. Great!" — John Leguizamo, writer, actor, performer. "The film is hilarious, heartbreaking and haunting. It’s dark, disturbing, thought-provoking, powerful and, at times, simply hard to watch. It’s a brilliant piece of work and a must-see."